Richard Hirons, Head of Sales at Stratstone BMW in Chesterfield visited our provision in support of NTC’s careers and employment focus for our young people in KS3 & 4. 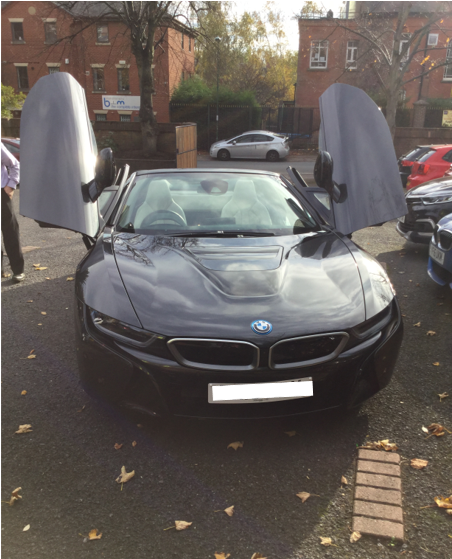 Richard provided our young people with the experience of sitting in one of BMW’s latest models, the i8 Hybrid Roadster. Richard gave an informative talk about various topics including, a typical day for him working at BMW, why he chose his career pathway, and gave a personal insight about employability and the skills required to meet BMW’s employment criteria. Our students were also treated to an informative Q&A session. Richard was asked to talk about his personal achievements to date, what skills were required for the role and his motivation to succeed. Our students were particularly interested in where it all began for Richard, as he grew up in and around the same locality as some of them and was able to associate with their backgrounds and the struggles that they may face as a teenager growing up in Nottingham today.